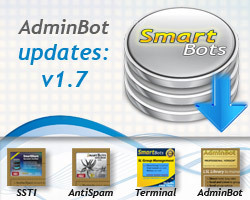 SmartBots AdminBot library has been updated to version 1.7. The new command has been added: SB_SETUP_SETOPTIONS. This command allows to set various options for AdminBot. The first option implemented is NO_OWNERCHANGE_RESET, it causes AdminBot to ignore the object’s owner change (the library resets itself on owner change by default). This option is useful if your device is pre-configured to use the same Second Life group for all owners. We’ve also created the AdminBot Changelog page, click here for detailed info.